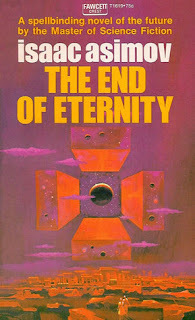 Because I Told You So: Book Report: "The End of Eternity"
Isaac Asimov didn't just present visions of the future, he put considerable thought into the moral implications of what factors such as artificial intelligence, time travel and space exploration would have on culture as well as the way it would skew the collective long-term purpose of mankind. "The End of Eternity" contemplates the effects that traveling through time would have on the moral makeup of political leaders, projecting moral wars that would span centuries. At the kernel of the treatise is a sad love story and gripping espionage thriller. Asimov's plotting would have held up just as well if no sci-fi was involved and all the backstabbing, misdirection and vengeance quests took place in a contemporary city. If he held true to his storytelling he would have ended up with something approaching perfection. Instead, he gives up on his story in the final chapters and takes to characters swapping monologues that would better serve as term papers.